I am not able to copy a freeze frame in iMovie ’11. This was available in iMovie ’09, but was not made available in iMovie ’11. 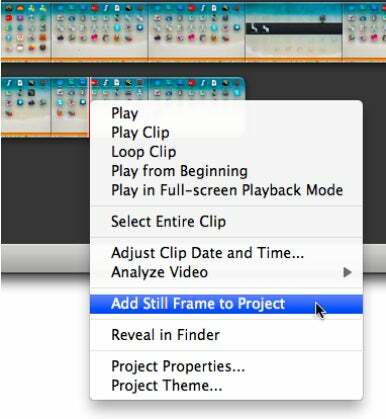 Does anyone know if Apple is planning on adding this feature to the current version of iMovie? No. And the reason why is because the feature is already there. You’ve just missed it. If you want to add a freeze frame from content in your iMovie library, move the cursor to the point in the clip where you’d like the frame and Control (right) click. From the contextual menu choose Add Still Frame to Project. As commanded, that still frame will be added to the end of the current project. By default the frame will last for four seconds. You can adjust its length by double-clicking on it to produce the Inspector window and changing its duration in the appropriate field. You can also add a freeze frame from content that appears in the project area. As you did before, move your cursor to where you’d like to create the frame, Control (right) click, and choose Add Freeze Frame. In this case the frame is created at the point where you placed your cursor, rather than placed at the end of the clip. This makes sense as it’s common to create freeze frames to extend a portion of a clip—either because you want the “camera” to linger a bit longer on the shot or you need to lengthen the shot to accommodate something going on in your sound track. If you were concerned about copying an existing frame, that’s just as possible. You can hold down the Option key and drag the frame to another location to copy it, select it and choose Edit -> Copy, or Control (right) click on it and choose Copy from the menu that appears.